Etiology: The cause(s) of the ME disease complex is not well-defined. Multiple factors including diet, intestinal flora, and the shift from neonatal to adolescent digestive physiology are thought to contribute to development of the disease. Diets low in fiber (<10%) result in a higher incidence of ME. No single bacterium has been implicated as a causative agent; however there are increased numbers of coliforms, and a toxin-like secretagogue is believed to be involved in the disease. Incidence: ME complex is uncommon. Transmission: Transmission of ME is unknown, however the disease cannot be reproduced by transfer of intestines or intestinal contents from rabbits with disease unless the cecum is acidified. Clinical Signs: There is an acute onset of disease in 7 to 10-week-old rabbits characterized by anorexia, polydipsia, a subnormal body temperature (99o-102oF), a rough hair coat, mucoid to liquid, tan diarrhea with perineal staining, abdominal distention with gas, and fluid-filled intestines. Affected rabbits may grind their teeth. Death usually occurs in 2 to 4 days. Rabbits usually survive the protracted course of 7 to 14 days. 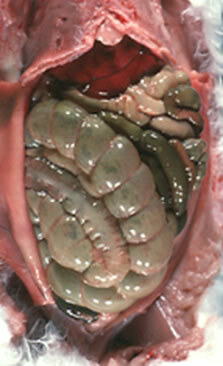 Pathology: Grossly, the stomach is distended with fluid and gas, the duodenum and jejunum are distended by watery fluid, dry matter and gas are found in the cecum (it is often impacted), and gelatinous mucus is in the colon. The characteristic histologic lesion is goblet cell hyperplasia with no inflammatory response in the small and large intestines and distension of the colonic crypts with mucus. Goblet cell hyperplasia of the gall bladder has also been described. Diagnosis: Diagnosis is based on clinical signs, gross lesions, and histopathology.